September 6-7 the FHDP will host a garage sale….please save all of your stuff to sell. We will be taking donations September 5….but if you want to unload it sooner call Laurie Mortinger at 635-5616 and we can get it picked up (we have a place to store stuff). 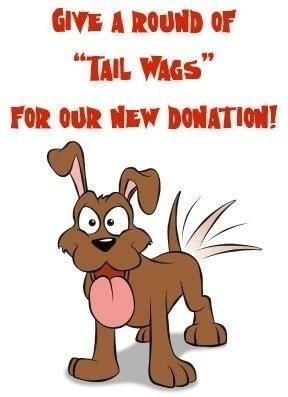 I have been to the storage site and there is some cool stuff there….but we really rely on your donations to make this successful! Curious about the next step? The next Friends of the Hays Dog Park meeting will be Monday, August 5 at 7:00 at the Community Assistance Center! We are thrilled to announce that the Schwaller family made a $10,000 donation to the dog park project!!! BIG Thank You to Golden Plains Credit Union and Emprise Bank for their donations to the Hays Dog Park!!! Cone visit the FHDP booth at Bargains on the Bricks between 7 and 1 on Saturday, July 20. We will have tshirts, brick forms, dog pendants, homemade dog treats, car decals, and a game!! Out booth was kindly sponsored by Sarah Cearley, the owner of Bella Luna and Simply Charmed! BIG THANKS Sarah!! !